When people talk about making lateral career moves, the response from friends, family, and mentors is often lukewarm at best. The concept of “up or out” is so deeply ingrained in American workplace culture that continual growth and movement up the corporate ladder are considered to be a universal aspiration. But as we’ve noted before, not everyone is cut out to manage people. In fact, some of your company’s strongest employees may be the people who have no interest in being promoted to a managerial role. It would be a mistake to assume that the employees who fall under that umbrella just want to rest on their laurels, however. Managers should be just as interested in developing the careers of lifelong individual contributors as they are in nurturing the upward trajectory of future company leaders. Through regular conversations about job performance and personal goals, managers or HR staff may find the best move— for the good of the company and for an individual employee’s career— is a sidestep into an analogous role in a different department. 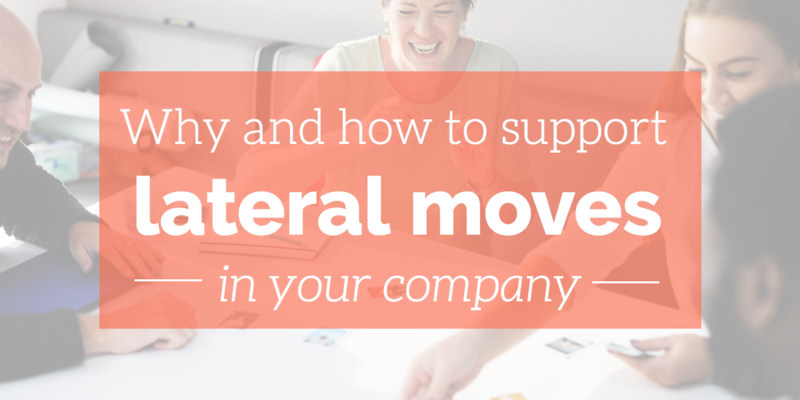 The mix of factors that go into the decision to pursue a lateral move will be different for each employee, and there are certainly plenty of good reasons other than the ones listed above. Whatever the reasons, it’s important for managers to advocate for what’s best for the employee’s career path, even when that means a move to another team. Helping employees make moves that are good for their personal skills and goals sends an important message to the entire workforce: that they’re not cogs in a machine, and that company leaders are committed to what’s best for them as individuals. This one cultural factor goes a long way toward increasing the loyalty employees feel toward their employers, and is good for nurturing an engaged workforce. Moving people along a predetermined career path and into management roles they’re not suited for is bad for everyone. For one thing, reluctant managers will likely either burn out or offer insufficient support to the people beneath them (if not both). Beyond that, however, the company will miss out on that employee’s best work. Allowing people to thrive in roles that are suited to their personalities and skills is better for the ecosystem of the company. Cross-pollination between teams and departments is often a great way to break through common roadblocks that slow down innovation in the company. When an employee from one department takes their knowledge and experiences into another role, they can serve as an advocate, building closer communication and finding solutions that will yield better outcomes. Unlike managers and the C-suite— whose focus is often squarely on meeting company goals— HR managers are generally aware of new best practices and workplace trends. Sharing examples of similar companies who have seen the benefits of allowing and encouraging lateral moves may be helpful in convincing leaders with a more rigid understanding of career paths that sideways moves don’t indicate a lack of ambition. Unfortunately, managers who welcome existing employees onto their teams may not be equipped to ensure that their new reports are properly trained. While a laterally-moved employee will likely not need the full onboarding and training plan that a brand-new employee would need, they are also generally not fully prepared to hit the ground running in their new role on day one. HR leaders can help ease the transition by working with the employee, their former manager, and their new manager to create a custom training plan that addresses existing skills without making faulty assumptions. Any major career transition—even if it’s within the same company—comes with bumps in the road. HR managers can help by providing a safe place to have productive conversations and facilitate discussions to get employees and managers moving forward on the same page. As an HR manager, your role as an advocate for what’s best for the good of the company often means that you have to ease employees and managers toward welcoming new ideas and approaches to common workplace situations. Building a broader cultural understanding of the various ways employees may want their careers to develop will take time, but as with any investment in employee engagement, it’s worth the effort.